Here you can find a sample of talks/presentations that I have given recently. “Particle Acceleration in Relativistic Plasma Turbulence” Magnetic Reconnection Workshop 2018, Princeton University, Princeton, New Jersey, USA, September 6, 2018. “Plasmoid Instability in Forming Current Sheets” 59th Annual Meeting of the APS Division of Plasma Physics, Milwaukee, Wisconsin, USA, October 23-27, 2017. “Plasmoid Instability in Time-Evolving Current Sheets” Los Alamos Astrophysics Seminar, Los Alamos National Laboratory, Los Alamos, New Mexico, USA, August 24, 2017. 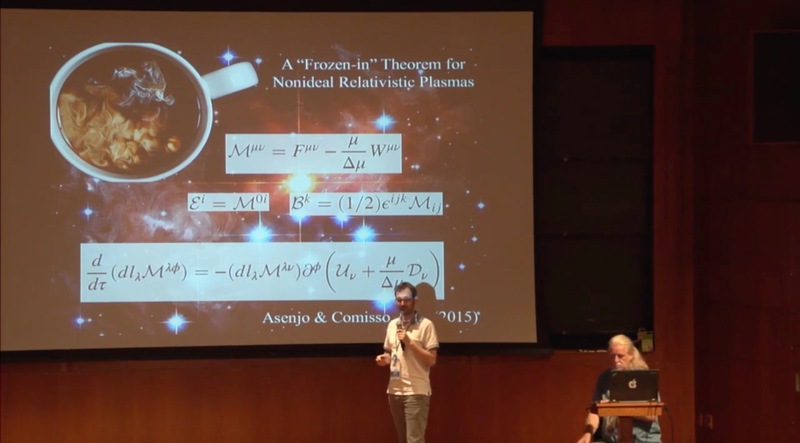 “Relativistic Reconnection: From Flat to Curved Spacetime” Astroplasmas Seminar, Princeton University, Princeton, New Jersey, USA, April 28, 2017. “Plasmoid Instability and Fast Magnetic Reconnection” Astroplasmas Seminar, Princeton University, Princeton, New Jersey, USA, February 26, 2016.